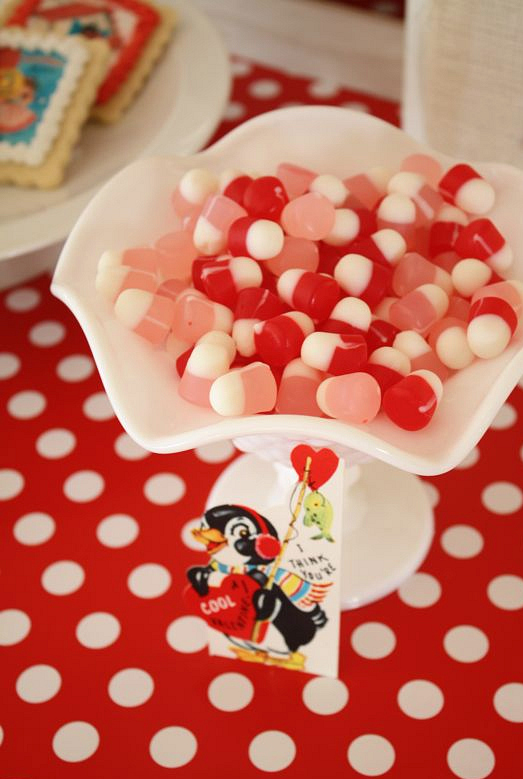 We had our annual Valentines exchange party last week and it was so much fun! 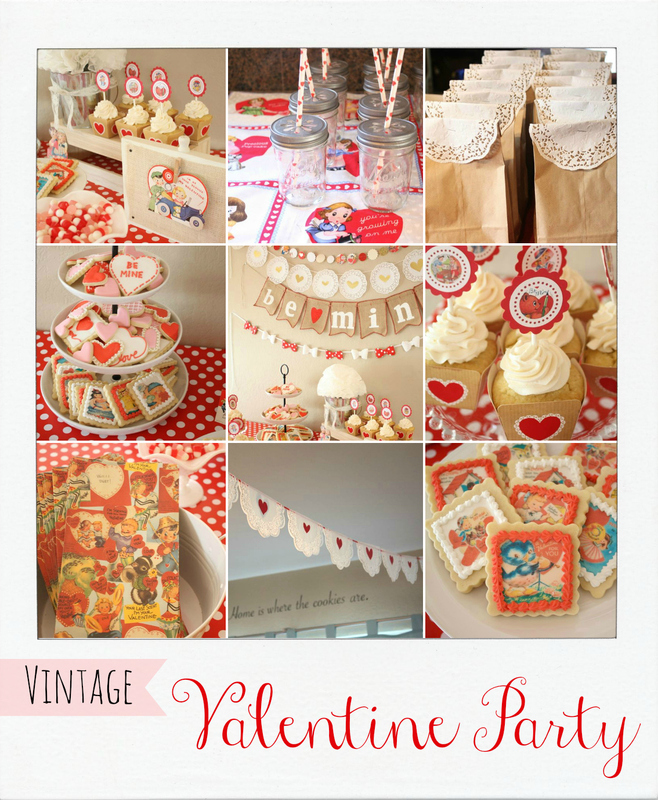 I chose a vintage Valentine theme and ran wild with it! 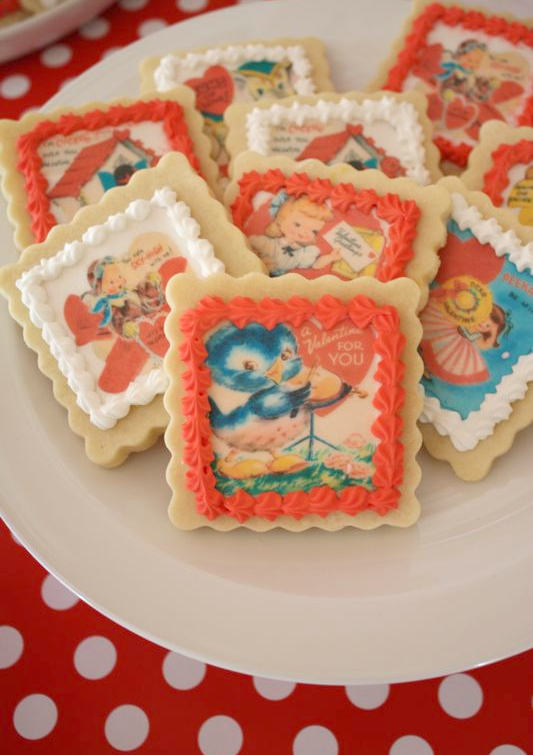 I made some of my sugar cookies-and really wanted to get some edible paper with vintage valentines printed on them. I found this fantastic shop and Joanna, the owner, was super quick to print and ship them off to me! I can’t say enough how amazing she was to work with. Thanks Joanna! I simply trimmed the images, piped some royal icing in a square slightly smaller than the image, then let it sit for about 2 minutes. Then I pressed the image into the icing, making sure it spread to all the edge. Then I let them dry, pressing any edges down again that curled up. Then I piped around the edges with a star tip. I got some cute festive gummy candies at, of all places, Walmart. 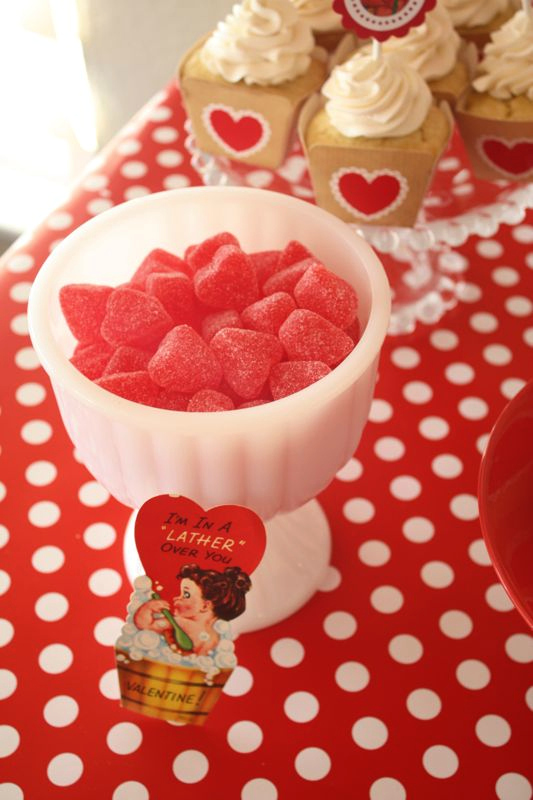 They were so cute and I put them out in a few pieces from my milk glass collection, with vintage valentines propped up in front. I made some vanilla cupcakes with caramel swiss meringue buttercream (sigh…yum recipe coming soon!) 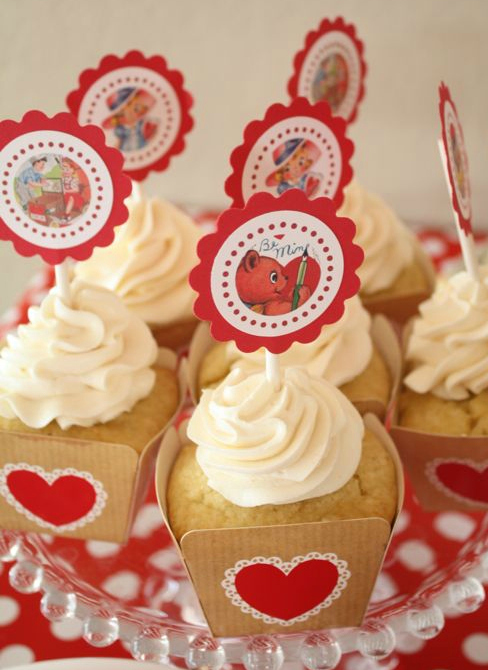 and made some cute toppers to match the theme. I got the awesome square cake liners here. 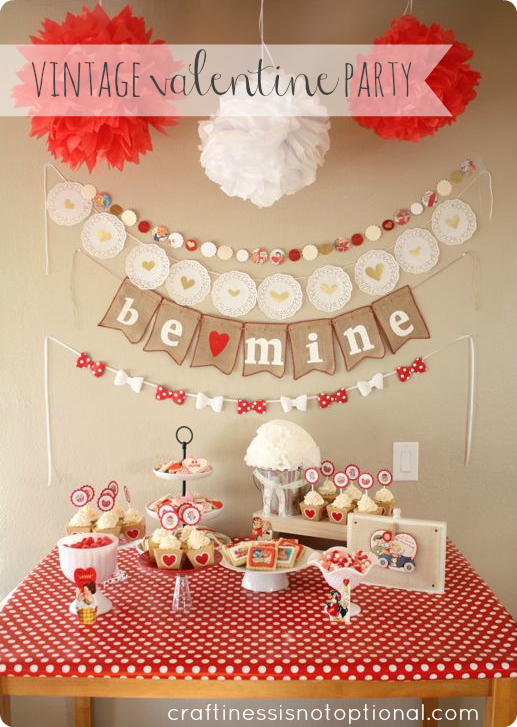 I displayed a Valentine on my photo display frame , then reused one of the wooden crates from Charlotte’s cowgirl party for some cupcakes, and coffee liner flowers in a tin pail. I made a few of the cake plates: the red one, and large white one in the middle, and the rest of the dishes were thrifted except for the tiered tower with the cookies on it, I got that at Target a few years ago. 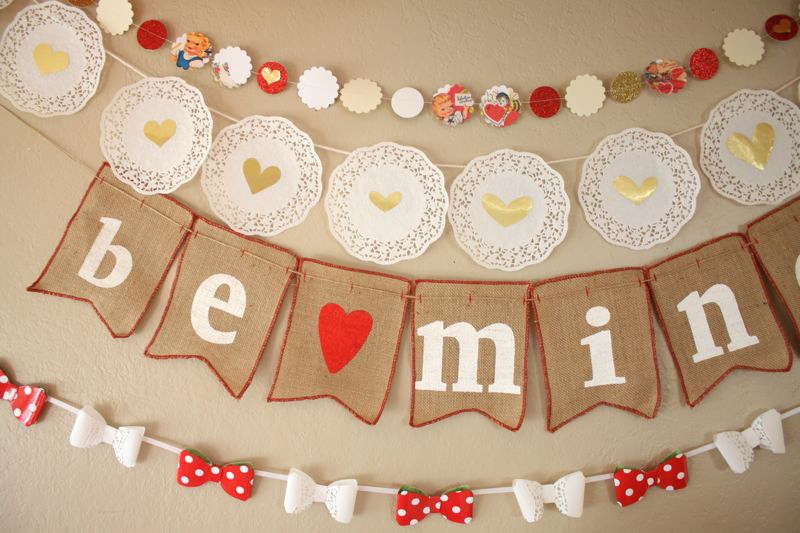 I got the “Be Mine” banner from Groop Dealz last month, then made the rest. 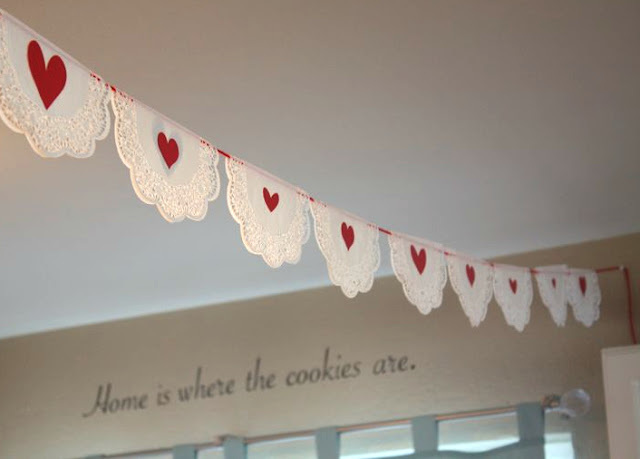 The top one is just scalloped and round punched paper sewn together, the next one is some small doilies with gold vinyl hearts taped to some yarn…and on the bottom, my bow garland. Then I made a few tissue puffs and hung them above the table. I found these bags at Hobby Lobby for the kids to collect their valentines in, and these are what kicked off the theme! 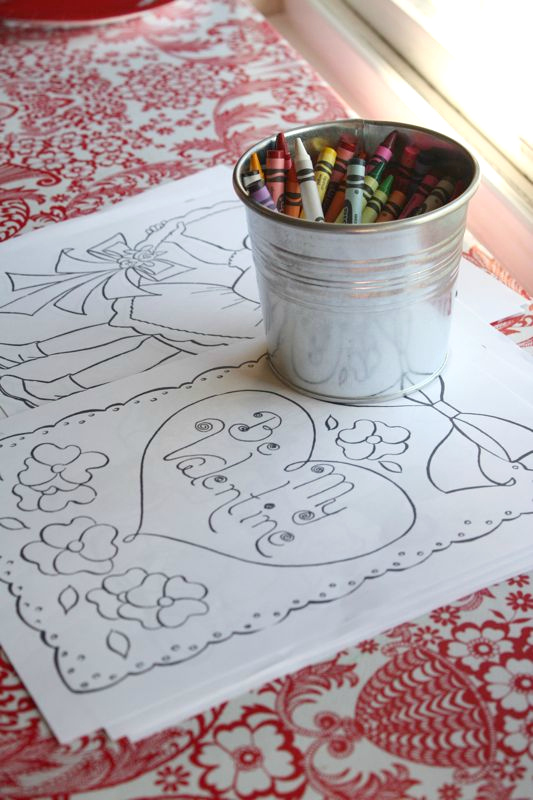 I found some free vintage-y valentine coloring pages online and printed some off for the kids to color in…Sadie was at this table a lot, she’s our little artist! 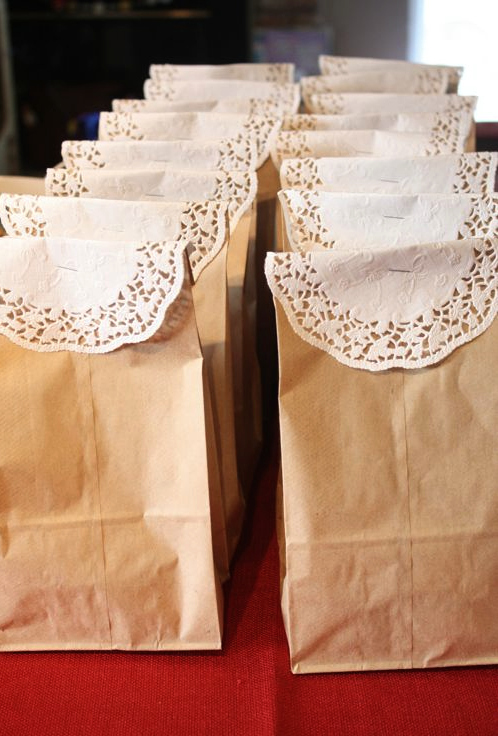 I made some easy but festive lunch bags for the kids-to make it easy for all the moms to grab ’em and find a spot to eat! 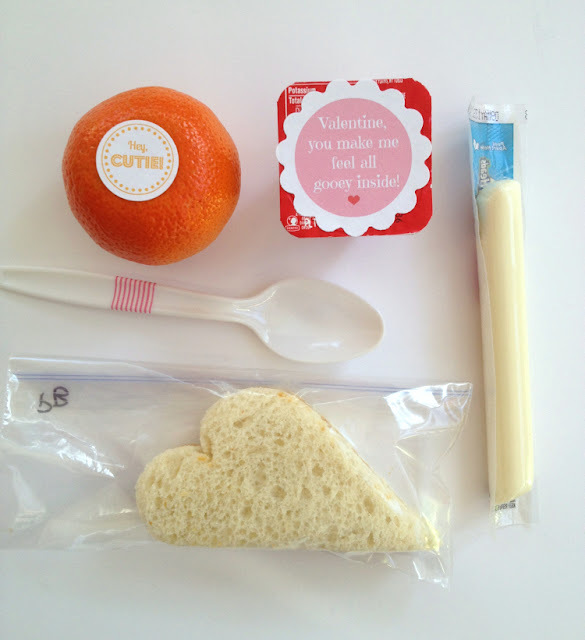 They included: a heart shaped sandwich, cutie, string cheese, yogurt, and spoon. Of course I added the cheesy labels…because I’m all about the cheese. 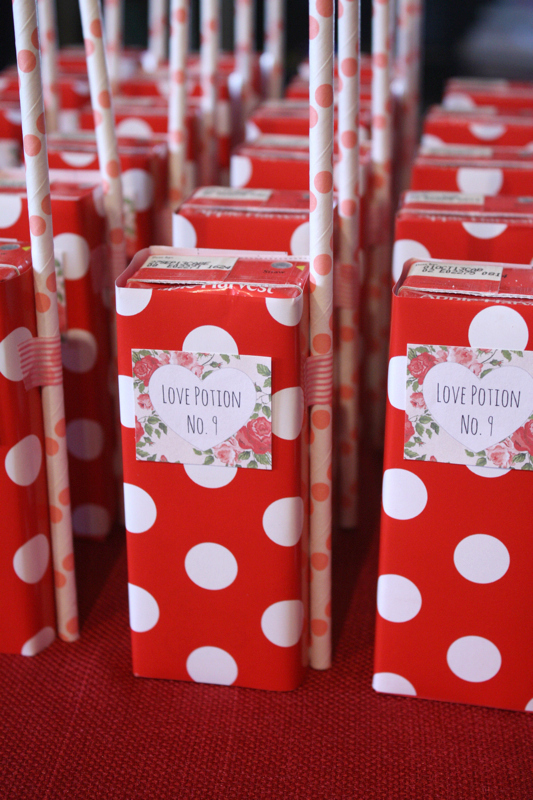 To wash down the kids lunch, I bought some red juice boxes, removed the straws, and wrapped them in wrapping paper (same paper I wrapped the dessert table in), then printed out and taped on a fun cheesy Love Potion no. 9 label and taped a paper straw to the side with washi tape. They fit perfectly in the juice box hole! For us mommas I set out a salad bar-complete with heart shaped cucumber slices, chicken, croutons, tomatoes, avocado, etc. It was yummy! Across the whole kitchen I hung up another doily banner, this time they were folded over some red yarn and taped, then I taped a red heart on each, cut out on my Silhouette. I have so much fun with our annual exchange party! 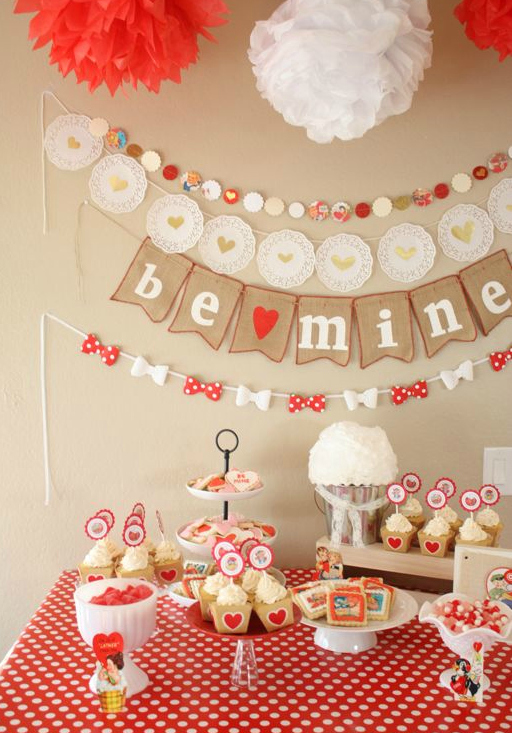 Next year I’m thinking LoveBug or Cupid’s Arrow for the theme…so many options! Did you go to any Valentines Day parties this year? This is awesome! I wish people in Australia got this into Valentine’s day! Thanks so much for mentioning me Jess! Everything looks AMAZING, I am totally in awe. The juice boxes! Darling! Oh my goodness! Every detail is just adorable and perfect. How much time does it take you to plan these things? I love it all (and am looking forward to that frosting recipe!). 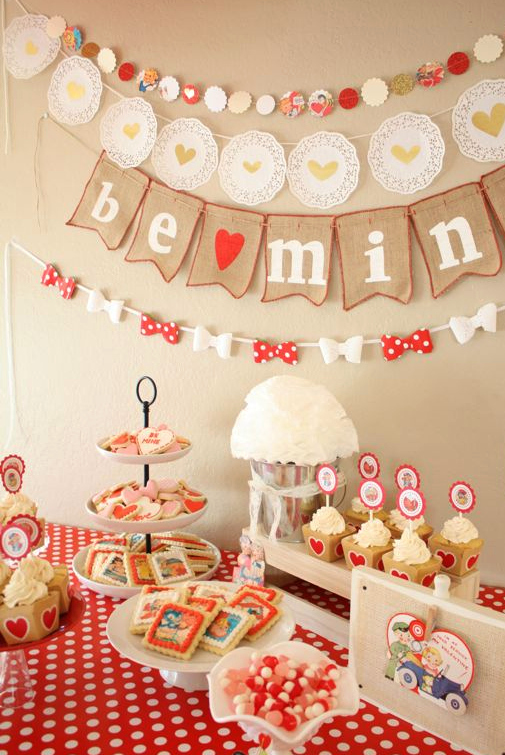 I just love your parties! Pinning to remember everything! OUT of CONTROL!! This party and all your work is amazing! I love the intro to one of your paragraphs “I simply…” and I thought “oh, there is nothing simple about this!” And I love your words I see in the background of your banner “Home is where the cookies are”. That should be in my house as I ALWAYS have my stock of gourmet (gluten free) chocolate chip cookies! You are unbelievable–with 3 kids underfoot? And you are the best cookie decorator–would drive me insane!!! GREAT work! Wow, amazing! I can’t believe you threw that party for everybody! Wish I was your friend! 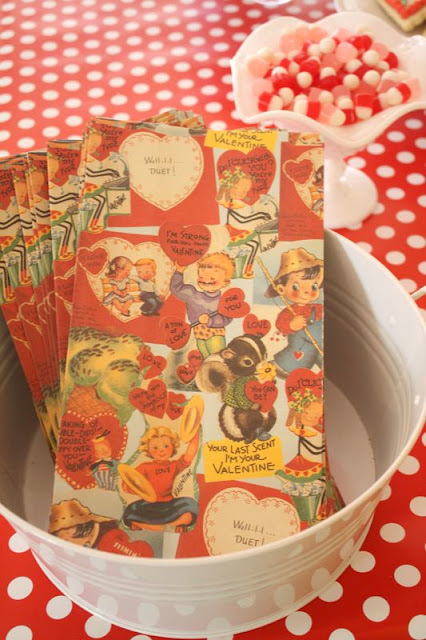 Great theme, the retro valentines are hilarious! The one that says “I’m in a lather over you” is too funny – I mean, who says that?? Everything looks awesome! So beautiful. Your website is pretty awesome, and hopefully its popularity and success continue to increase. I do miss the links to other crafty blogs that used to be on the sidebar. Amazing!!! I can’t believe all that amazing work with three kids. My third baby is 6 months old and I’m lucky to get a shower every day. This is amazing, Jess! 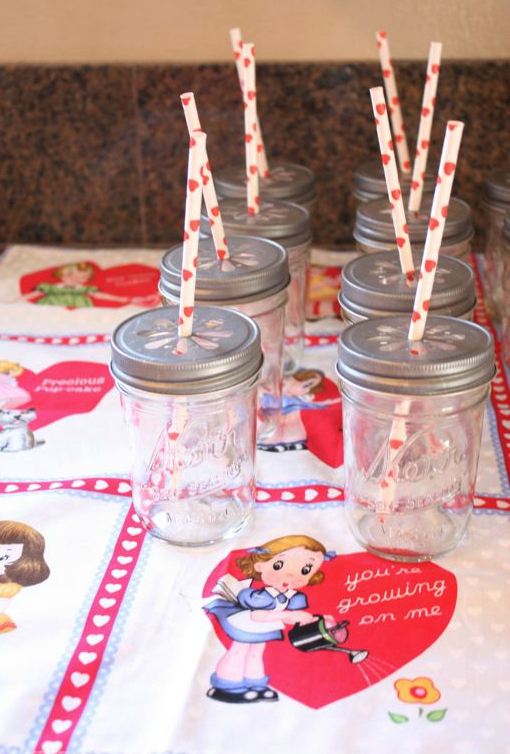 Where did you get the rad lids for the mason jars? Yes, you are amazing!! 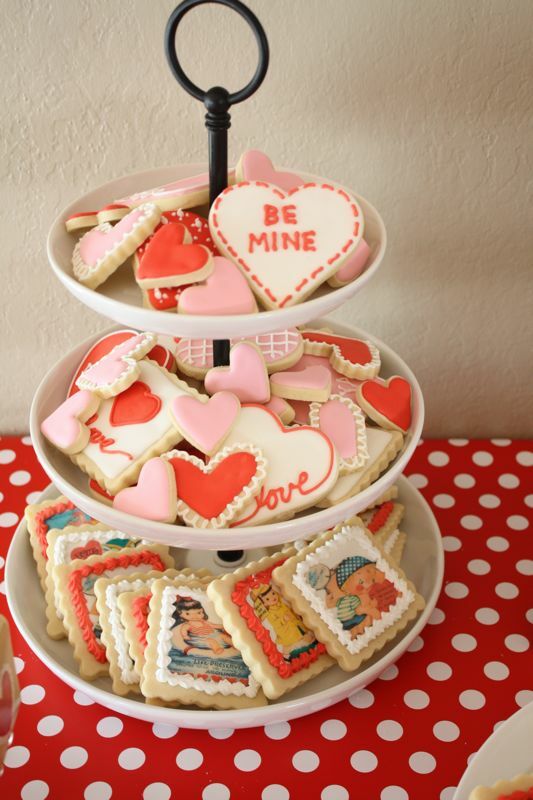 Everything looks adorable and those cookies are just perfection. You are awesome! Jess!! You are simply amazing!! This is really incredible, awesome job! This is beautiful. I can’t believe that you did all of this amazinginess with a fairly new one at home, bravo. Do you sleep? What a fun way to show your littles you care. 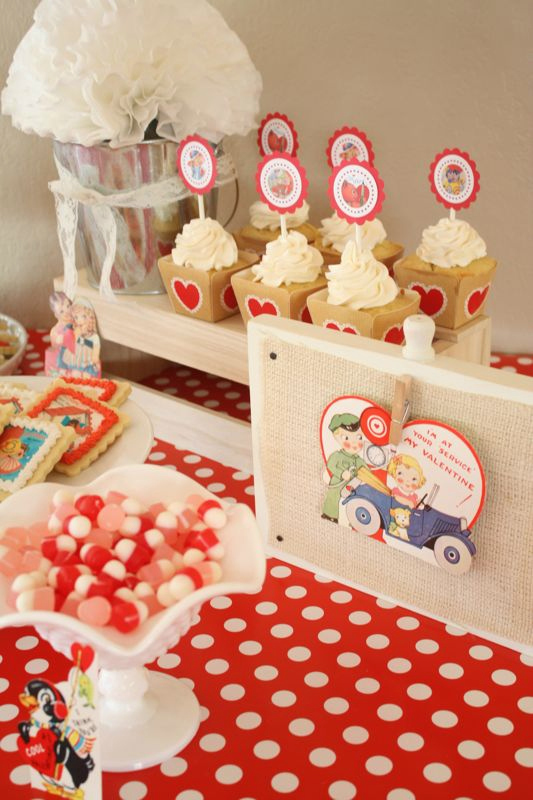 This is such an adorable party! Oh my–looks like you had so much fun! Do you still have the link to where you found those adorable vintage valentine coloring pages?? I’m getting desperate and it’s almost the 14th! Sorry, I don’t! I just googled around for them though, you could try that!